Make that 14. Tonight (Dec. 6, 2017) in Las Vegas at the Professional Rodeo Cowboys Association's (PRCA) annual banquet, Deadwood's Days of '76 Rodeo brought home its 14th consecutive PRCA Medium Rodeo of the Year award during the PRCA National Convention. The rodeo, billed the "Best Rodeo. No Bull." has won the award annually since 2004. 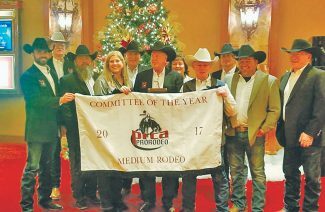 Prior to that, it had won the PRCA Small Rodeo of the Year award four times, as well as the Badlands Circuit Rodeo of the year. 2018 will mark the 96th annual Days of '76 Rodeo in Historic Deadwood. The event, July 24-28, 2018, includes five days of rodeo action along with historic parades.